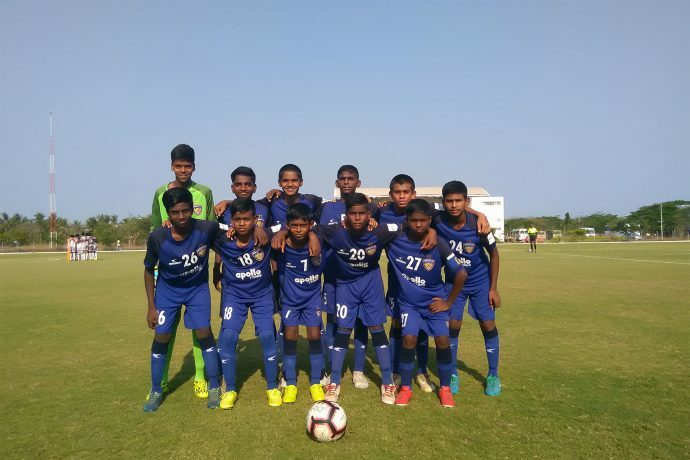 The Chennaiyin FC Under-13 team registered their second win in the 2018-19 Hero Sub-Junior League Chennai Zone with a comfortable 4-0 home win over Chennai City FC Under-13s at the SSN College Ground in Chennai today. Chennaiyin scored two first-half goals courtesy M. Ajay Kumar and K. Karmugilan, with G. Arulesh providing the assist on both occasions. Varun Kumar added one from the spot after the break as second-half substitute E. Kannan scored the fourth to round off a dominant performance. With this win, the CFC U-13s made it two wins in two with 15 goals scored and none conceded so far. The CFC U-13s’ next encounter will be against Raman Vijayan Soccer School (RVSS) U-13s in another home game at the SSN College Ground on Sunday 31st March 2019 with kick-off at 4 PM. Chennaiyin came into this tie with an unchanged starting eleven, having beaten Great Goals by a whopping 11-0 scoreline in their opening Sub-Junior League encounter last week. All four CFC goalscorers against CCFC now have two goals apiece to their name, having scored a goal each in the opener against Great Goals. It was all CFC from the outset, who were controlling the play and having majority of the possession. Hat-trick hero K. Srinith from the previous game was CFC’s driving force in midfield, with skipper Akash M. and S. Nagulan providing solid defensive cover. It took Chennaiyin just eleven minutes to open the scoring, when Arulesh did well to find Ajay in the box, who showed composure to take a touch and find the back of the net. The CFC U-13s continued to dominate proceedings as most of the action in the first period was played in the CCFC half. And it was 2-0 to them soon after, with Arulesh again the provider, this time finding Pondicherry boy Karmugilan in the box, who finished with aplomb. After the break, Karmuligan was at it again, when he was fouled by a CCFC defender in the box. Varun Kumar stepped up and converted from the spot to make it 3-0. Second-half substitute E. Kannan then joined the scoring party with a curling left-footed shot from outside the box to make it 4-0 to CFC. He had come into the fray few minutes earlier for Mohammed Irfan.